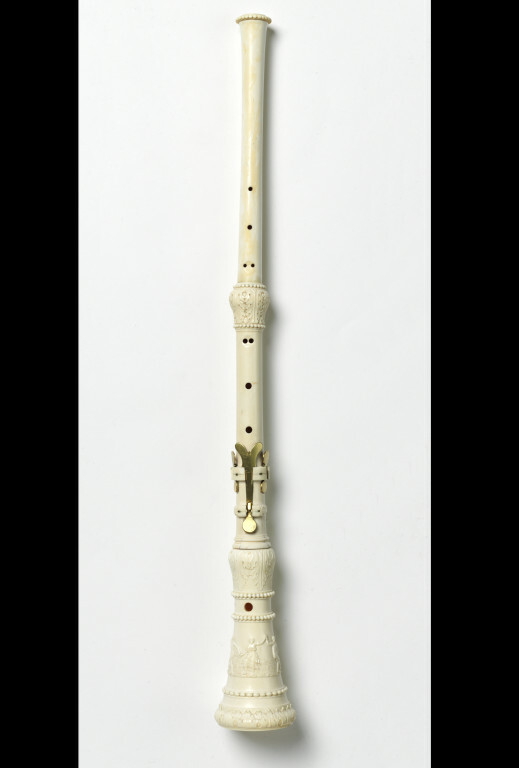 This beautifully carved ivory oboe was made by Giovanni Maria Anciuti of Milan, one of the greatest wind-instrument makers of his day. It was most likely made between 1717 and 1740, the period from which Anciuti's dated instruments survive. Earlier oboes like this example have simple holes bored into them, and only the lower ones are covered with keys, so as to facilitate the natural stretch of the hand. Before the museum acquired this oboe, it formed part of a decorative trophy of old wind instruments that hung on a wall of the Paris apartment of Gioacchino Rossini (1782 - 1868), the great Italian composer of light opera. On loan to the Horniman Museum. This object formerly belonged to Gioacchino Rossini (1782 - 1868), and formed part of a trophy of instruments that hung on a wall of his appartment in Paris. It was aquired by the South Kensington museum from M, Baur, a Paris-based dealer, for £40 in 1869. Baines, Anthony. Catalogue of Musical Instruments in the Victoria and Albert Museum - Part II: Non-keyboard insturments. London, 1998, p. 96. Peter Thornton, Capolavori lignei in formato ridotto, in Arte Illustrata, Anno V, n.47, gennaio 1972, (pp. 9-12, pp.50-7, pp.108-110, trans. by Elena Lante-Rospigliosi. Translated from the Italian - "The museum also owns two ivory wind instruments which are beautiful examples of carving, particularly interesting in that they belonged to Rossini. The maker of both was J. M. Anciuti of Milan, one is a recorder and bears the date 1740, the other is an oboe with very gracious young dancers depicted at the lower end (fig. 10)." Anciuti's surviving instruments date from 1717 until 1740. The inclusion of symmetrically arranged keys indicate that the left-hand-over the-right-hand playing position had not yet been fully established. This instrument was bought for £40 by Carl Engel for the South Kensington Museum, following the death and sale of the instrument collection of the composer Gioacchino Rossini (1782-1868) in Paris.